The number of Maersk vessels experiencing delay at APM Terminals at Maasvlakte II as a consequence of bunker activities reduced significantly during a Pronto pilot. The involved parties explain how real-time insight into each other's scheduling helps prevent bottlenecks. 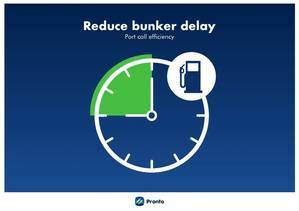 The online communication platform Pronto enables optimisation of port calls in the Port of Rotterdam by visualising the scheduling of all involved parties real-time in one environment. Countless activities take place within the tight windows for loading and unloading of container ships at the terminals, including bunkering. "Rotterdam is an important port as it's often the first or last port of call for Europe," stated Marcel Jumelet, Marine Business Process Owner at Maersk. "However, our vessels have a tight sailing schedule: there's hardly any buffer between the ports they call into. If a Triple E vessel (18,000 TEUs) is delayed for a few hours in the Port of Rotterdam, this can result in delays of over a week later on in the schedule. That's why timely handling of bunker activities is important for both the terminal and the shipping company." Some 19% of large Maersk vessels experienced delay at APMT MVII as a consequence of bunkering not taking place at the agreed time. This also presented problems for the terminal, stated Ad van Strien, Planning Manager at APMT MVII. "If a vessel remains berthed for longer than envisaged, we have an idle capacity situation: this means we can no longer optimise our crane capacity. Don't forget that the biggest container ships take up around half our quays."